#kitchengizmo SNAP'N STRAIN has got to be one of the coolest kitchen products I've used! 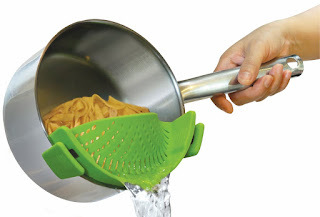 I always dread straining pasta or potatoes into a regular strainer because I end up spilling some or burning myself. The SNAP'N STRAIN is held in place by 2 clips the snap onto the sides of just about any pan or bowl. Just tilt the pan or bowl to strain, leaving the food in the pan. No transferring, just tilt. I love this thing! Takes up about a quarter of the space as a regular strainer to store, and if you are limited on storage space like I am that means a lot. Dishwasher safe and very durable. I highly recommend this product!